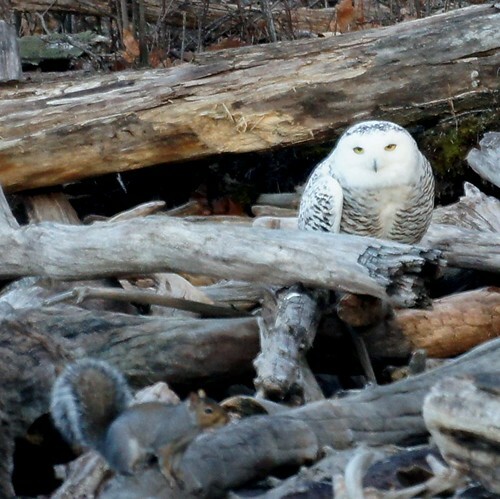 Squirrel walking past a snowy owl. The owl must not have been hungry, but he did watch attentively as the squirrel walked by. 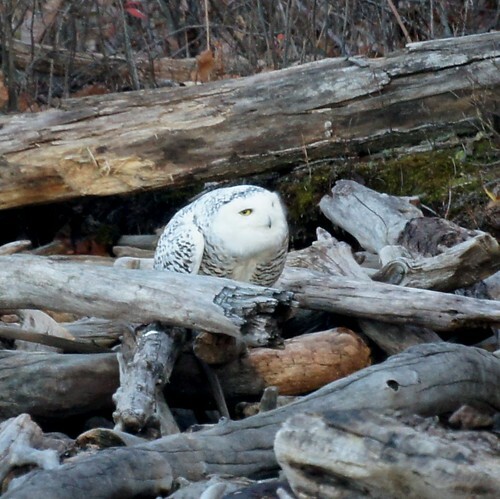 The snowy owl has been reported at Merrill Creek the past 5 days so when the weekend came around, we just had to go. Fortunately, he doesn't move much during the day, so once someone spots him, others can find him easily. If you are intersted in seeing him, head toward the vistor center at 34 Merrill Creek Rd, Washington, NJ 07882. Park in the fisherman's parking lot (go straight instead of turning right at the fork to the visitors center). There is a gravel path to the left of the parking lot and he has been found past the dam for a few days. Today, someone was nice enough to place an orange cone on the trail marking where he was and there were about 10 birders on the shore. If you go, please do keep your distance so he isn't disturbed.